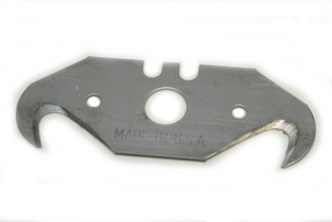 PRODUCT: ENGLISH HOOK UTILITY BLADE WITH HOLE, HEAVY-DUTY HIGH CARBON STEEL. LONG LASTING FOR ROOFING SHINGLES. 0.025" THICK X 2" LONG x 3/4" WIDE. 100/BOX. PRICE/BOX. MADE BY C&R. LONG LASTING FOR ROOFING SHINGLES. .025" THICK X 2" LONG x 3/4" WIDE. These long lasting blades easily cut linoleum, flooring, roofing, & corregated materials. Fits most standard utility knives. Made from the toughest tempered steel and has a unique deep hook design which outlasts other brands.